Summer is coming and it’s time to think about how our air conditioning is going to work when it gets hot! Delivery of cooling is a crucial step in the home comfort system. If an HVAC system performs poorly, it may not be the unit itself; instead, it might be the ductwork system. Today, we’re going to look at some of the factors which can contribute to inadequate airflow. If the ductwork is too small, the system has to blow longer and harder to get heating and cooling to the rooms, and will never quite do the job adequately. Undersized ductwork is most common when a residential system is changed from one type to another. 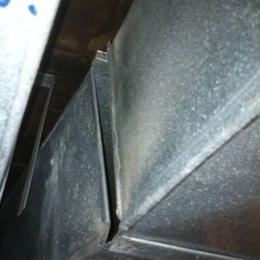 Extreme angles can cause blockages in the ductwork in the ductwork, itself. Flexible ductwork is notorious for such kinks and sags, but blockages aren’t limited to flexible ductwork by any means. Restricted airflow cuts down on the efficiency of the system, which in turn makes the unit work harder, which causes early mechanical difficulties. While we think of our ductwork as being snug and safe in our attic or crawlspace, years of use, the house settling, and other factors can create leaks in the system. The amount of heat or cooling loss through leaks can be considerable. Remembering that every degree you need to add in winter or subtract in summer from your thermostat to make your house comfortable costs you money you can see how a constant leak could severely bleed your wallet just by constancy. If a register is too small or not open, the entire system works less efficiently. Something as simple as a piece of furniture in front of or on top of a register can hamper airflow and create cold or warm pockets. Think of the system as being designed to circulate the air in a room 7.5 times per hour. If the flow of air is slowed, diverted, or blocked at any point, the system has to work harder, efficiency is compromised, costs rise, and the inhabitants aren’t breathing fresh air. We know it’s redundant to talk about the importance of changing the air filter. But, not merely because it improves the air quality or because it protects the system from dirt and foreign particles: it also helps with the airflow into the system, which is the critical starting place of the airflow through the handler and system. It will also add 5-10% to your bill. If your system is operating inefficiently, the best thing to do is to have a qualified HVAC company come out and do an assessment of the system, check for leaks and correct any issues. Over time, the improved airflow will pay for the service by easing the wear and tear on your HVAC unit and in long term energy savings.